A team of sixaquanauts and two handy robotic surgeons will plunge into the Atlantic OceanMonday to test new medical and exploration tools for long duration spaceflight. Led by U.S.spaceflyer Heidemarie Stefanyshyn-Piper, a crew astronauts, doctors anddivers will descend to an undersea laboratory off the Florida coast at 10:00a.m. EDT (1400 GMT) to kick off NASA's Extreme Environment Missions Operations(NEEMO) 12 expedition. Piper, NASA astronaut Jose Hernandez and four crewmatesplan to spend the next 12 days staging mock moonwalks and telerobotic surgeryexperiments at Aquarius, anocean floor laboratory 67 feet (20 meters) underwater near Key Largo,Florida. "Telemedicine and robotic surgery could be the key tomaintaining the health of future spacefarers and responding to medicalemergencies in space," said NEEMO 12 crewmember Tim Broderick, agastrointestinal surgeon from the University of Cincinnati, of the mission. During NEEMO 12 crew, Broderick will evaluate theperformance of the 50-pound(22-kilogram) Raven robot, a portable two-armed automaton built byresearchers at the University of Washington in Seattle, and the M7 surgicalrobot constructed by Menlo Park, California's SRI International for possible spaceflightapplications. Both robots are designed to be operated remotely by surgeonson land, with a team of three doctors to command Raven via the Internet fromconsoles at the University of Washington's BioRobotics Laboratory in Seattle. The robots will be guided through a series of tasks on a simulated patient. Working alongside Broderick will be Josef Schmid, NASA'sfirst flight surgeon ever to visit the Aquarius laboratory. "Schmid'sunique experience in space medicine will benefit the mission itself as well asthe future development of crew care techniques for long-duration humanspaceflight missions," said Bill Todd, NASA's NEEMO project manager at theagency's Johnson Space Center astronaut training facility in Houston, Texas. DiversJames Talacek and Dominic Landucci, of the University of North Carolina atWilmington which oversees Aquarius for the National Oceanic and AtmosphericAdministration, round out the NEEMO 12 crew. Ravenresearchers said their surgical robot relies on smaller computers and powersources that can be disassembled and packed into dive bags for the descent downto Aquarius. But perhaps most important, Raven engineers provided the NEEMO 12crew with an instructional manual to assemble the robot and troubleshoot anyunforeseen problems, they added. "When you build a technology as a lab prototype, ittakes someone with a Ph.D. six weeks to put it together," said BlakeHannaford, co-director of the University of Washington's BioRobotics Laboratory. "If you build something for the field, it's got to be repairable, modularand robust." Stefanyshyn-Piper,a trained U.S. Navy salvage diver, is a veteran of two spacewalks and 12 daysin space during NASA's STS-115 construction flight to the International SpaceStation in September 2006. 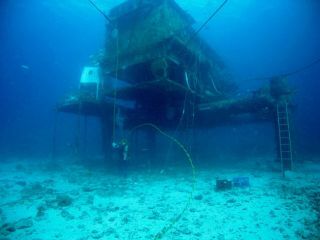 Broderick is making a return trip to Aquarius, wherehe worked as part of the underseastation's NEEMO 9 crew in April 2006. "We need tofigure out better ways to care for astronauts before we make the long trip toMars," Broderick said.